Presented by BOZAR CINEMA and CINEMA PARENTHÈSE #10, in co-production with International Film Festival Rotterdam - IFFR and Centre Pompidou Paris. Charlotte Pryce (1961, UK) has been making experimental films, photographs and optical objects since 1986. She also produces magic lantern shows. Originally from London, she emigrated to the US, where she earned a master's degree and taught in Chicago and San Francisco. Currently she teaches experimental film at Calarts (California Institute of the Arts) in Los Angeles. Her films have screened in numerous festivals including Rotterdam, Oberhausen, Toronto, San Francisco, New York, Hong Kong, Ann Arbor and London. A Kinematographic Film Comprised of Five Brief Fictions in Which is Explored the Mystery of Insect Flight. Interpretations of a Mythological and Fantastical Nature are Illuminated in Motion and Time. Three Miniature, Illuminated, Heliographic studies of plants, observed and imagined. The individual titles of the films are: Burnt Umber/ pale ochre/ Burnt Umber, The Talk of Lichen on a Lonely Day, Those whose Attachment to the Earth is but Tentative. The film is entirely hand-processed. An intoxicating flower; a metaphorical insect; a longing reach across the centuries. The film is a philosophical search drenched in luminous colors and sparkling light. (having grown the beautiful tulip I fell deeply under its spell- an affliction shared by an artist from another time and place- yet the dilemma we faced was shared: to fall for such luxurious and temporary beauty raised a fear (a reminder -- a fly) of the transience of life). The film is entirely hand processed. A manuscript illuminated: illustrations retreat into the fiber of the page; a fleeting light dissolves into the emulsion of the film: an elusive story is revisited. Looking Glass Insects takes its title from chapter three of Through the Looking Glass and its classic original illustrations by John Tenniel. Delighting in the act and play of observation the film finds a visual metaphor for the cinematic process in the antics of the original story; making use of magnifying glasses as an optical pun, pointing to the instruments used by both entomologists and filmmakers alike. Yet the insects of the story fade away, just as the observations that appear in the film's magnifying glass dissolve into darkness when tilted to reflect the "natural" world beyond the book. Witness an alchemist's spell: the transmutation of light into substance: a glimpse of gold. "Winding germs and glowing flowers colour this alchemical 16mm miniature. Pryce spins gossamer golden threads in the silent darkness of the cinema. The book The Mirror of Alchemy from 1597 states: 'The gold obtained through this art surpasses natural gold in all its attributes both medically and in every other way.'" W. H. Hudson's Remarkable Argentine Ornithology is a live performance utilizing authentic refurbished Magic Lanterns with hand made lantern slides. The piece appears to relate the tale of famed naturalist Hudson's spell-binding recollection of birds seen as a child from the pampas of his native Argentina--yet hidden within the exotic views and extraordinary plumage are speculations of a less flighty nature. Delicate threads of energy spiral and transform into mysterious microscopic cells of golden dust: these are the luminous particles of the alchemist's dream. Prima Materia is inspired by the haunting wonderment of Lucretius': De Rerum Natura. It is an homage to the first, tentative photographic records that revealed the extraordinary nature of phenomena lurking just beyond the edge of human vision. The film depicts an encounter with a mysterious, luminous, electrical substance. Inspired equally by medieval accounts of visionary experiences and by 19th century photography of the invisible, Pwdre Ser joins Kirlian photography with hand-processed images. Pwdre Ser is the Welsh name for a mythical substance that has been observed by many since the 1400's. 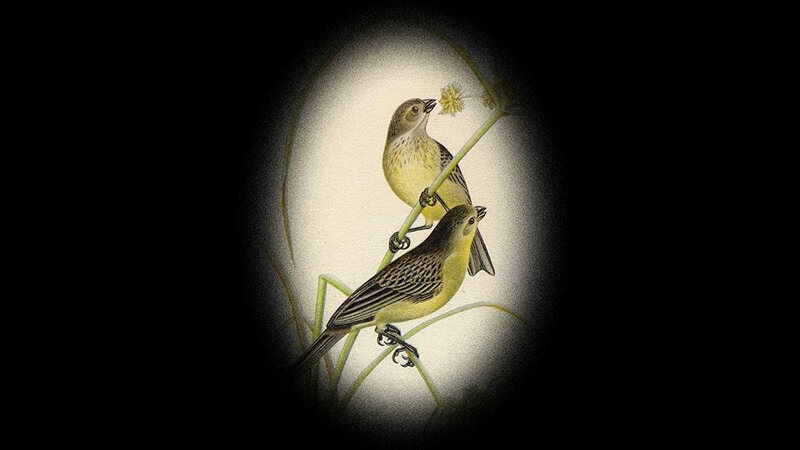 A live performance with vintage magic lanterns and handmade lantern slides tells the tale of famed naturalist Hudson's spellbinding recollection of birds seen as a child from the pampas of his native Argentina. But the magic lantern also brings out other, hidden layers, including an encounter with nature teetering between joy and dread.